The Fossil Vintage range re-lives some of the best traditional vintage moments from our fashion past. The particular Zeitgeist being re-enacted for this fabric tote is the utilitarian look. This style is one that constantly cycles in and out of fashion, and it will have re-occurred time and time again throughout the course of the past 40-odd years. This means, of course, that you can rest assured it will always be somewhere close to being in fashion again, allowing you to justify the cost to yourself that much easier! As for the bag itself, well there is something classic about it that makes it rather attractive. Yet, at the same time, it is (of course!) rather practical, what with all the pockets and the massive spacious interior. My only hesitation, as with all cream bags, is how easily they get stained, especially if they are in a simple non-waterproof fabric. You'll just have to be careful! 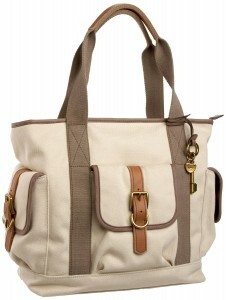 In a practical canvas and with bags of vintage safari charm, Fossil has created yet another cute and spacious tote. The Fossil Vintage Re-Issue satchel, a great alternative to this retro bag.